Al Qaeda's second-in-command mingles with over 100 fighters, commanders - but how did US intelligence agencies miss him? 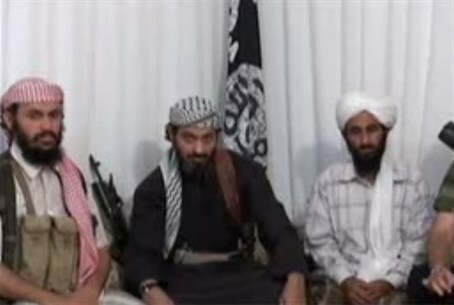 Remarkable footage of the largest and "most dangerous" meeting of Al Qaeda commanders in years has emerged online. The footage - obtained and translated by CNN - shows the jihadist group's second-in-command, Nasser al-Wuhayshi, meeting openly with fighters and commanders in Yemen. Al-Wuhayshi, who heads Al Qaeda in the Arabian Peninsula (AQAP), was apparently unfazed by the prospect of US drone strikes, which have killed several of his predecessors - raising the prospect that the western intelligence community was either unaware of the meeting until it was over, or found out about it too late to scramble attack drones. But another possibility could be that whilst aware of the meeting, intelligence agencies would have been more interested in listening in to the proceedings for valuable information than disrupting it. Speaking to the more than 100 assembled fighters, al-Wuhayshi pledged a renewed war on the US. "We must eliminate the cross... The bearer of the cross is America!" he declares. The reference to the Christian crucifix has chilling significance given Al Qaeda's concerted attacks on Christian communities throughout the Middle East and Africa - particularly in Syria, Egypt and Iraq - aimed at erasing the ancient Christian presence in those areas. AQAP is considered the most dangerous of Al Qaeda's numerous branches, and has been involved in several recent attempts to strike on American soil, including the infamous Christmas Day underwear bomber plot.